A double-sided single sheet covering the following 1.4 California models for the German market Language : German. Issued March 1994 with publication no. 01075. 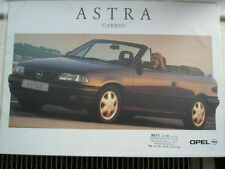 A rare original Opel Astra Cabrio brochure dated Aug 1994 with Italian text. Brochure is 8pp illus in colour and is in very good condition. 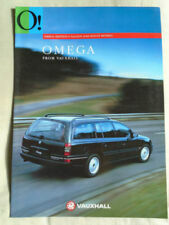 ITEM NUMBER V7393 PUBLISHED AUGUST 1993 VAUXHALL ASTRA CAR RANGE BROCHURE. 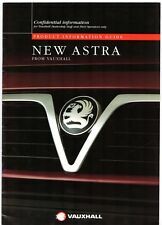 FOR SALE VAUXHALL ASTRA RANGE UK SALES BROCHURE. HAVING A STUDY CLEAR OUT OF MY MOTORING LITERATURE FROM 30 YRS IN THE MOTOR TRADE. PUBLISHED SEPT 1994. Photo shows brochure in a clear A4 wallet (label is on the wallet, not the brochure). 14-sided A4-size colour stapled brochure. Dated June-August 1994 and covers mid 1994 models. Double sided single sheet, illustrated to the front only, English text. Photo shows brochure in a clear A4 wallet (label is on the wallet, not the brochure). 16-sided A4-size colour stapled brochure. 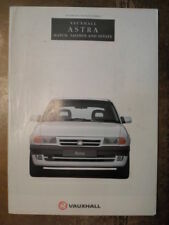 A rare original Vauxhall Astra range brochure dated Aug 1993 for 1994 models. Brochure is 64pp illus in colour and is in very good condition. 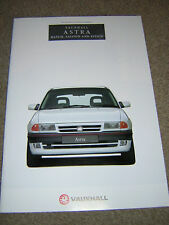 A rare original Vauxhall Astra Convertible range brochure dated Mar 1994. Brochure is 14pp illus in colour and is in very good condition. 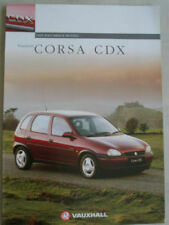 A5 FORMAT 24 page COLOUR BROCHURE - 1994, UK. Dated April 1994 and covers 1994 models. 6 page folder, well illustrated, English text. Features the Special Edition Astra Swing 1.4i & 1.7 diesel versions. A4 size 6 page foldout style UK sales brochure. Publication number: V10318. Dated April 1994. ITEM NUMBER V10340 PUBLISHED SEPT 1994. 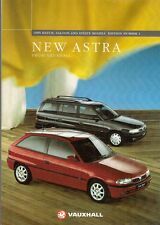 1995 ASTRA RANGE CAR BROCHURE. This is pair of original Colour Vauxhall press photos of the Vauxhall Astra Mk3. Vauxhall Astra Mk3. Both were issued by Vauxhall's press office in Luton to the motoring press in 1993 & 1995. The second photo shows Astra Montana 5 door hatch SE, N516BHK.